The 11th edition includes extensive updates and additions from top dealers, service managers, and technicians. Service Check Sheets provide a valuable reference for service managers and technicians. It is also a great tool for the service department when working with extended service contracts. 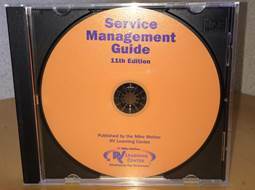 The guide provides reasonable guidance relative to the time required for competent technicians to complete assigned tasks. It is an important part of the service management system, but should not be the sole determinant of prices or rates charged in that sale of service. NOTE: a digital file suitable for import into third-party software is available from Spader® Business Management.